While I frequently post about Oklahoma non-compete agreements, I rarely use graphics to illustrate my points. This post is one of those rare occasions. I created this diagram to illustrate the flow and process I might go through in analyzing an Oklahoma non-compete agreement. 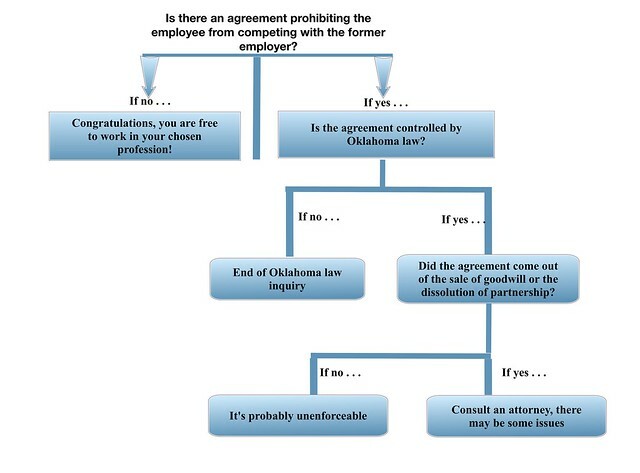 The Diagram is by no means a replacement for consulting an attorney but it should provide a glimpse at the issues and decision-making for initial analysis of a non-compete agreement controlled by Oklahoma law. Enjoy. For more Oklahoma business law tips, sign up for the email list below.